Cancellations in the final week before check-in will result in the first night's stay being charged. Cancellations in the final 2 days before check-in will result in the full amount being charged. Situated in central Waterford, Portree House consists of 2 separate properties - a period guesthouse and an international backpackers. Both properties feature free WiFi and free private parking. 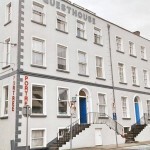 We just 5 minutes’ walk from Waterford‎ Railway and Bus Station.This elegant, period house has been lovingly maintained and furnished, with high-quality modern facilities. Each private room features an en suite bathroom and boast a flat-screen TV. Portree House offers a secure garden, along with a spacious guest lounge with 24 hour tea/coffee making facilities and a flat-screen TV with Irish channels as well as BBC1, BBC2, Sky News and Channel 4. The TV is used to show all major sporting events. In the mornings, the Portree serves traditional Irish breakfast along with lighter continental options. Guests are free to make use of the fully equipped kitchen to prepare meals and enjoy them in the dining area. Portree is located at the end of a quiet cul-de-sac, yet is only a 5-minute walk from Waterford's shops, restaurants, and pubs, along with theatres and clubs. Waterford Distillery neighbours the property. We have free secure bicycle storage, which proves handy for those cycling the Waterford to Dungarvan greenway which starts on our doorstep! Please note that all prices are room only but breakfast is available on request (Eur 6.5 for Continental or Eur 9 for Full Irish).